It is important in an industry such as cave mining to keep up-to-date knowledge, experience and best practice at the forefront to maintain the best possible level of safety for all involved. Unfortunately, much knowledge is proprietary to commercial research project sponsors. The Australian Centre for Geomechanics Caving 2018 Symposium, with Collaborating Organisation SRK Consulting (Canada) Inc., will provide the global mining industry with the opportunity to explore the latest cave mining developments, technologies and practices. There are over 50 global cave mining projects in various stages of studies and development. Despite the fact that the cave mining method is more than 100 years old, it is only within the past 20 years that this method has spread from initial cave mining centres to six continents. There are currently approximately 17 cave mining operations in 11 countries. The interest in cave mining is being fuelled by the depletion of near surface orebodies suitable for open pit operations, relatively high production rates and low operating cost. Also, a number of open pits have a continuation of the orebody below their economic depth, and further exploitation of often large low-grade resources at depth would not support a more expensive mining method. In recent years, besides the economics of high strip ratio, the environmental concern also plays an important role when comparing open pit mass mining and caving. Cave mines can have a significantly smaller footprint than a comparable open pit, since waste mined is only limited to underground infrastructure development. Traditionally, cave mining was a method based on the principle of undercutting rock and then naturally letting it cave. However, this mining method has been extended to very strong rocks which would not easily cave or would not be suitable for caving due to very coarse fragmentation. To mitigate this problem, pre-conditioning techniques have been developed to generate more fractures and reduce the fragments to a manageable size. This is achieved by hydraulic fracturing and, in some cases, in combination with confined blasting. Although some discussion is needed about the potential impact on in situ stress that is required for cave mining, several cave mines are in operation with preconditioned rock masses and several others are being developed. The most extensive work undertaken is at Cadia East mine and Northparkes Mines in Australia, and Andina and El Teniente in Chile. Caving methods can be used with any type of commodity since it is the geological and geotechnical context that is important. There are many parameters to consider but typically the orebody needs to be at least 100 m thick for cave mining to be economical. In the past, typical caving heights were 150-250 m. Most of the designs which are on the drawing board today have caving lifts in excess of 350 m. Although higher lifts generally result in better NPV, they also have higher business risks of resource sterilisation, dilution, stability of the drawpoints, and extraction level in general. By contrast, orebodies with relatively small horizontal footprints can also be mined economically if they have sufficient height and metal content to justify the capital expenditure. Good examples are Northparkes Mines in Australia, and the diamond mines in South Africa and Canada. Mechanised cave mining includes several variations of the method, including block, panel, incline and front caving. 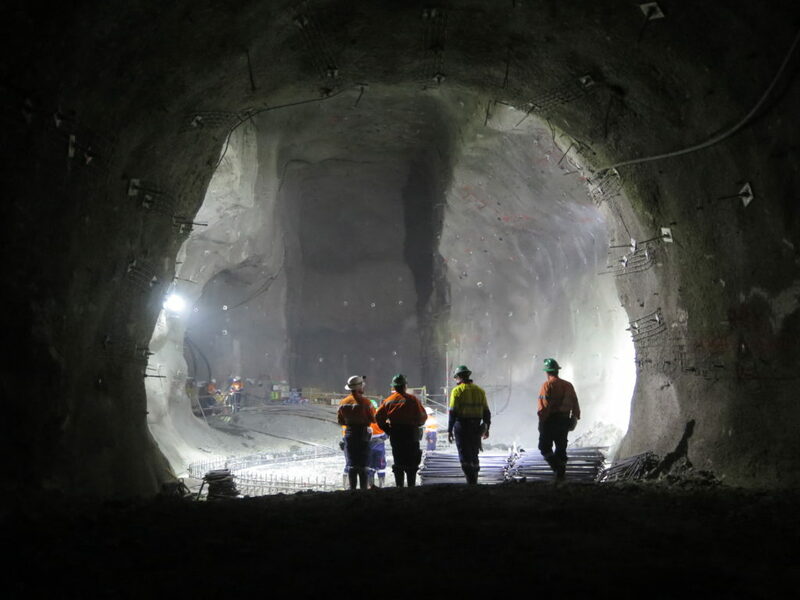 Most of the current mines and projects utilise either block or panel caving but after several years, Ekati Diamond Mine, Canada successfully introduced an incline cave at their Koala Mine. Cave mining differs significantly from other typically more selective underground mining methods in a number of areas. Because cave mining is a bottom up method that relies on first establishing a large fixed infrastructure underground that will provide a very long term production platform, the initial capital costs are typically very high. To offset the impact of the large capital expenditure on project value, a consequent high rate of production and an increased tonnage per drawpoint is required. In this day and age, several cave operations are running at upwards of 50,000 tpd and newer operations are being constructed for nameplate capacities of 100,000 tpd and more. Chuquicamata and New Mining Levels at the El Teniente project in Chile; Oyu Tolgoi projects, Mongolia; Grasberg caving complex, Indonesia; and the Resolution Copper project in Arizona all fall into the supercaves category. It has to be stressed that there are no examples where tonnage over 100,000 tpd was achieved on a sustained basis from single cave footprint, although El Teniente produced higher tonnage from concurrently mining several caves. In terms of logistics, once a cave mine is in production, the execution is relatively straightforward. The production footprint remains fixed and mining consumables typically revolve around secondary breaking with campaign maintenance within the production drives. It is important that strict draw control is maintained and the extraction level is not experiencing excess damage requiring repairs. As the number of cave mining projects increases, there are also heightened expectations for high production rates and caving lifts, and greater depths to be achieved. The analysis of the cave mine performance is far from satisfactory. In the past two decades, at least 12 cave footprints were put into production and all experienced some level of unforeseen difficulty related to ground conditions, fragmentation, mining induced seismicity, mudrushes, and underestimating ground support, or simply breaking basic cave mining rules, specifically in the area of undercutting and draw management. On a positive note, in hindsight, most of the challenges could have been prevented with better upfront knowledge, correct design or draw disciplines. The other disadvantage of cave mining is the long lead time, it typically takes 7 to 10 years, or longer, from initial studies to production and the site may underestimate the logistics and skillset required for cave mining development and operation. Because the cave mine has to be fully developed before all design parameters are known to a high degree of confidence, the design should be robust and technical success should have priority over economics, especially when greenfield projects are considered. Although the cave mine may not require the same level of resource definition in terms of drillhole density as selective underground mining method, the geotechnical and structural geology knowledge has to be typically higher than for other methods. Some of the information needed for the final feasibility design may not be possible to obtain from the drill core, and underground characterisation exposures may be necessary. Cave mining is moving to new frontiers with high production rates, strong rock masses, very high caving lifts and greater depth. In forefront of such projects is Resolution in Arizona where their shaft was sunk to 2,100 m to develop deep copper porphyry. Block and panel caves are very suitable for highly automated equipment like remote control loaders, trucks and crushers. A future supercave could potentially have less than 50-60 people underground. The ever-increasing speed of computing and the sophistication of numerical modelling codes enable many mining companies to model complex mining problems. Better and more reliable instrumentation such as MPX cables, Smart Marker System (Elexon), and Cave Tracker (Mining3) also provide excellent data for calibration of such models. However, do not count on the high reliability of numerical models without calibration. Reliable and accurate input information for numerical models are typically available only after the cave is designed, developed and operating. The track record of predictive models without comprehensive calibration, especially for greenfield projects, is not very good and does not necessarily increase confidence in the design in comparison to other empirical tools and benchmarking. Additionally, complex processes such as cave propagation, subsidence geometry, and material flow in a cave mine cannot be yet reliably modelled. Visit www.caving2018.com for more information.